October 12, 2018 Rev. Robert Moeller, Jr.
And as [Jesus] was setting out on His journey, a man ran up and knelt before Him and asked Him, “Good Teacher, what must I do to inherit eternal life?” And Jesus said to him, “Why do you call Me good? No one is good except God alone” (Mark 10:17-18). There are several words the man in our Gospel seems to misunderstand. The first is “good.” “Good Teacher, what must I do to inherit eternal life?” Jesus replies, “Why do you call Me good? No one is good except God alone.” In essence, “You keep using that word, ‘good.’ I do not think it means what you think it means.” The man has a faulty understanding of what it means to be good. It is this misunderstanding Jesus seeks to correct first. “Why do you call Me good?” He asks. “No one is good except God alone.” Jesus is not denying His divinity but wants the man to examine his own speech and motives. If this is empty flattery, it is worthless. If the man wishes to call Jesus truly good, then he will be speaking of His divinity. And that would have implications for a far different conversation if the man realizes and believes he is talking with the Son of God. The man’s faulty understanding of good is closely related to his own understanding of himself. In Matthew’s account, he not only addresses Jesus as “good,” but asks what “good deed” he must do to inherit eternal life. He is thinking too highly of himself and what he can do and not nearly highly enough about God and what He has done, is doing, and will do on behalf of man and His creation. Jesus changes the focus from the man’s works to who God is. The challenge for the man is to stop counting his own good works and to see the enormous demands a perfect God can and does make. Then his hope will go from Law to Gospel, from His deeds to the saving action of God in Christ. The second word the man misunderstands is “inherit.” “Good Teacher, what must I do to inherit eternal life?” the man asks, using the correct theological terminology that connects salvation to an inheritance in God’s kingdom. But the word does not mean what he thinks it means. And so, it is a flawed question. After all, what do you do to inherit anything? It is something that is done to you. Someone out of the love and graciousness of his heart, makes you an heir and bequests what is his to you upon his death. An inheritance is not given based upon merit. There is nothing that can be done to earn birth (or adoption) into a family which provides the inheritance. Although the man is sincere, he is far from faith. He doesn’t want to Jesus to save him from sin, but to approve of who he is and the good he has done. Since the man asks a question about keeping the commandments, Jesus gives him an answer about keeping the commandments meant emphasize what it really means to be good. The commandments are a natural complement to the perfect goodness of God. God’s perfection is reflected in His commandments. Jesus says to the man who would be “good”: “You know the commandments: ‘Do not murder, Do not commit adultery, Do not steal, Do not bear false witness, Do not defraud, Honor your father and mother’” (Mark 10:19). But this preaching of the Law only leaves the smug man in his sin: “Teacher (notice how he is no longer calling Jesus good), “all these I have kept from my youth.” The verb “kept,” phulasso, occurs only here in Mark. It is the careful watching of a shepherd over his sheep (Luke 2:8), the guarding of a strong man over his goods (Luke 11:21), and the fierce preserving of His own by Jesus (John 17:12). The man has not merely observed the commandments but claims that he has zealously protected them. He says he has kept the commandments since his youth. I do not think “kept” means what he thinks it means. Ironically, while he has, in his own estimation, such a perfect record, yet he is driven to find greater security by asking what else he has to do to earn his salvation. Salvation by works drives one either to empty vanity or desperate searching. The man in our text embodies both at once. If you seek to be saved by being good, you never really know if you’re being good enough. Only Mark tells us Jesus “loved him.” Jesus does not speak harshly or out of anger, but compassionately, winsomely. He seeks to strip away the man’s self-deception about having kept the Law while He also opens the door to a true relationship with Himself and eternal life. Though Jesus knows the man’s coming rejection, He truly loves him and invites him to follow Him. Instead of showing the many occasions when the man has broken the commandments, Jesus offers him a new path. Just as a new path has been prepared for Jesus, so Jesus offers this man a new way through one step. Charity doesn’t earn eternal life, but Jesus is talking this man’s language, speaking to his heart. Will he “keep” the commandments or his fortune? Giving away all he has will be a true test of faith, faith which alone saves. “Disheartened by the saying, he went away sorrowful, for he had great possessions” (Mark 10:22). Certainly, this is one of the most ironic verses in the Bible. The man has riches and, in his opinion, a faultless moral life. And yet, since he cannot part with his wealth or admit his failings, he leaves sorrowful. The word “disheartened,” stugnadzo, occurs only here and Matthew 16:3 where it describes the stormy sky. The man’s hopeful beginning darkens severely. How unnecessary is this man’s sorrow! For the love of him and the whole world, the Son of God is about to give up all things, even His life, and bear the sorrow that now crosses this man’s face. The rich man walks away. And Jesus lets him go. He loves the man, but in love He will not force the man to be repentant. Jesus will, however, go to the cross and die for the sins of the rich man. 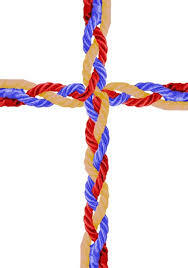 If, later on, the man repents of his sin, the benefits of the cross will be there for him. Just as it is for every man, woman, and child who turns from his or her own self-righteousness, works, or merits, and instead trusts in Jesus’ blood and righteousness for forgiveness, salvation, and eternal life. Those who hear God’s Law and see their sin, who hear the Gospel and see their Savior. So…what about you? What did you hear today in this text? Did you use this story as a spiritual mirror to examine yourself? To look in your heart for your idols? If so, did those words leave you disheartened? Will you go away sorrowful? Or will you repent of your sins and self-righteousness and depart in peace? Unfortunately, many people feel this Bible story does not apply to them. But if you don’t think the Law applies to you, you’re misunderstanding Jesus’ words. We all have our idols. We all have things we fear, love, and trust in instead of our Savior—even if it looks to the outside world like we’ve got it all together. We all have a tendency toward self-righteousness. It’s too bad that this is the way the story ended. This is how the rich man should have begun—sorrowful. Sorrowful for his sins. Kneeling in repentance, rather than as a matter of protocol. Following Jesus, trusting in Jesus’ mercy and love for eternal life, rather smug in his self-righteousness, or burdened with the guilt of unforgiven sin that still remains in his otherwise very respectable life. As you hear Christ’s absolution of forgiveness from your pastor’s mouth—whether privately or corporately—you can be certain that his forgiveness is Christ’s forgiveness. Your sins are forgiven by Christ Himself. Then properly prepared, come forward to the rail and silently kneel to receive the love of your Savior in His Holy Supper. Don’t promote yourself. Don’t excuse yourself. Don’t say anything but “Amen.” Just open your mouth and receive Christ’s very body and blood given and shed for you, for the forgiveness of your sins. Receive His blessing and depart in peace, even as the rich man would have, had he not gone away sorrowful that day. Jesus has laid up an eternal inheritance kept in heaven for you. Go in the peace and joy of the Lord. You are forgiven of all of your sins.